service for the global indian community. Krunch is a simple tool that simplifies the process of compressing and sending your files online. Picasa for Linux is being launched by Google as "Labs" version. dotReader is a new open source e-book reader. It runs on multiple platforms including Windows, Macs, Linux, tablet PCs, and most PDAs can reads multiple document formats with the ability to add additional formats via plug-ins. Future OPAC: Web services that could be mixed and matched? The catalog of the future wouldn't be a catalog; it would be a series of standards-compliant Web services that could be mixed and matched. ..Networks are about sharing now; they used to be about control. Networks are two-way; they used to be one-way. Networks are about aggregation more than distribution; they are about finding and being found.. Even in a journal that is widely available in research libraries, OA articles are more immediately recognized and cited by peers than non-OA articles published in the same journal. SRU (Search/Retrieve via URL) is a standard search protocol for Internet search queries, utilizing CQL (Common Query Language), a standard query syntax for representing queries. SRW (Search Retrieve Web Service) is a companion protocol to SRU. The Library of Congress serves as the maintenance agency for these standards. Today I found a Video interview of Richard Poynder, a Freelance Journalist, with Open Access advocate Stevan Harnad. It is an excellent interview of about 30 minutes that can be viewed on a multi-media PC having a Windows Media Player installed. Apart from OA Publishing and Self-Arching, Prof Harnad also talk of role of librarians in OA Movement. Here are the Broadband and Dial-up Links. jLibrary is a DMS (Document Management System), oriented for personal and enterprise use. * Play with technology! Kick the tires! Springdoo is a free service that lets you talk your emails. "1. Everything I Need IS On The Internet. 7. Look Ma, No Books! 10. The Internet Is Already Ubiquitous And Portable." Libraries are in the process of redefining from repositories of books to ever-evolving community and information centers but according to OCLC's study, Perception of Libraries and Information Resources 2005, the public seems to still cling onto our old image believing libraries are synonymous with books not information. The aDORe Archive allows for the storage of mutliple XMLtapes and ARC files through the introduction of OAI-PMH compliant XMLtape and ARCfile registries. Its Source Distribution is available for download. Never browse outdated posts again: a new feature on Google Blog Search now lets you narrow your search by date. Just tried the new web-based video uploader for Google Video as annouced in their Official Google Blog: Instant gratification, Google Video style. Shot up a small video through Sony Ericsson K750i Camera Phone. It created 3gp file. Opened up the Uploader -- and done in a minute or so. "MedBioWorld: Medical/Medicine and bioscience journals, associations and resources" is medical and biological resource directory. Covers journals, associations, news, databases and companies. Medical Download.com Lists and offers downloads for various softwares that can be used in medical areas like billing, medical records, practice management etc. It includes - Introduction to Social Software, Blogs, RSS, Wikis, folksonomies, social networks and other social software tools like Instant Messaging applications and Podcasting. There is a rather long posting with on going discussions - whether browsing the Library stacks should still continue in this web age. (stevenberlinjohnson.com: Can We Please Kill This Meme Now). Here is my opinion. -- Browsing / Surfing is one way of acquiring knowledge and to satisfy the inner hunger for information. Call it infotainment – entertainment with information. One can get this type of entertainment either visiting a library or sit in front of desktop. Books / other published documents in a library does go a filtering and selection process – first in the publication process then in the selection process of the library. Hence reliability of the contained information is somewhat ensured. The same cannot be said about whatever goes on Internet. Persistency and referencing is more reliable in case of library collection – though referencing by links is much easier on web. However, it is also true that as time passes, Internet is evolving into a library. Google Notebook is now up. It works similar to what I expected. Does the work like clipmarks but in a much cool manner. Moreover, Google Search Engine has been leveraged in a good fashion. Installation is very simple - you need a Google Account ( your gmail account will do ). In mine case - as soon as I logged in - it asked for downloading a Firefox extension. This was done in seconds. Next time when Firefox was opened, it had a small Notebook icon towards the right bottom corner. Working with it is Simple - mark anything in your Firebox / Browser and click -> notebook icon -> Add Note. You are done. While searching with Google, it shows - "Note this" hypertext under each hit. Infomancy Blog has a post comparing Subject Headings with Tags. It argues that while "Subject Headings" are technically correct but "Tags" are right in the sense they reflect how the end user approach a particular information item. PLoS Biology provides robust evidence that open-access articles are more immediately recognized and cited than non-OA articles. Terry Kuny and Gary Cleveland in their article “The Digital Library: Myths and Challenges" IFLA journal 1998 24 (2)7347 had rejected Internet as Digital Library. 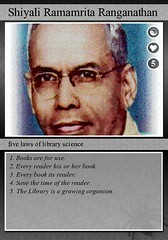 They regarded it a myth to consider it as a digital library. As a bookstore cannot be called a Library in the same manner Internet providing access to huge information resources cannot considered as a Library. “Finding information is difficult, the quality of the information is quite variable, and reliable, professional assistance for the confused and lost is lacking”. I have been keenly observing in past few years the emergence of a trend to organize the Internet (WEB) resources so that these are useful to the potential users. Yahoo was probably the first popular tool to hand pick and organize information resources into categories. Then came the voluntary efforts to create an Open Directory (Open Directory Project). Yet another landmark I consider is the emergence of social tagging platforms like Del.icio.us for bookmaking and Flickr to share Photos. Interestingly Nature Publishing Group produced Open Source Software – Connotea and a free site to “help researchers and clinicians manage and share information”. It handles academic references far better than Del.icio.us. Now only days back Goggle launched Google Co-op. Here you can categorize the URLs in way you know better and people can subscribe to your categorization. This means that now you as a librarian can categorize and organization the web resources in a manner that could be useful for your patrons!! Well it is expected that they subscribe to your categories while searching. And this has started happening - Just noted that [US] National Library of Medicine is a major contributor. So Is Internet evolving into a Digital Library? Information Wants To Be Free Blog has a comprehensive post on using ( or not using) Social Networking Software like MySpace and Facebook in Libraries. Google has extended Gmail chats in 17 more languages. According to Official Google Blog Four products are being launched by Google. Google Co-op - You can help Google Improve search results in the topics you know best. Google Desktop 4 - Next version of Desktop Search Tool that can "Quickly search your computer"
Google Trends - could provide insights how the world is interested in topic that you are looking for. Top RSS Feeds in Medicine inspired me to create a OPML File. The idea was to share a single URL instead of list for collection of useful feeds. So I opened my feed aggregator - BlogBridge and created a new "Guide". After this was done I started adding the suggested feeds one by one. It was not simple - and I was struck on the first feed - PubMed itself. It is a huge database - the problem was what to select? I queried for India and set the Limits for "Added in Last 30 Days" and "Links to Free Fulltext". It was now a short list. I was ready to same it as RSS Feel. Next came the Journal Sites. The publishers are offering multiple feeds packaged by Current Issue or Most Read Articles. I picked only a few from them. Once I completed my "Guide" in BlogBride I was ready to export it as OPML file. I exported it to my desktop. Now question came - How do I share it? I first tried "Share Your OPML". I was little disappointed that I could not find any way to share my OPML as a URL. Then I searched for some other service. Soon found out OPMLworkstation.com where I could upload my OPML. Hopefully my OPML should be visible to people from this link. NLM released a new version of the Gateway that includes access to two additional NLM resources. Users are now able to search the Household Products Database and the Bookshelf, a growing collection of full text biomedical books. "The digital library should strive towards an openly accessible, modifiable knowledge base where each object is identified, where changes to objects are rigidly described, and upon which an extensible set of similarity operators can be defined." Does this means that a Digital Library needs to follow Open Access? The traditional concept of a library is being redefined from a place to access paper records or books to one that also houses the most advanced media, including CD-ROM, the Internet, virtual libraries, and remote access to a wide range of resources. Consequently, Librarians or information professionals, increasingly are combining traditional duties with tasks involving quickly changing technology. Soon Librarians' Duties would include BLOGS, WIKIs, WEBCASTS / PODCASTS, IM, RSS and WEB. A master’s degree in library science and information is desireable professional qualification along with masters in biological sciences. In addition awareness of Concepts like Library 2.0, WEB 2.0 and Knowledge Management would also be required. However the problem with Medical Libraries in India is that their Salary Structure can afford only a clerk not a professional. Even a Degree College offering B.A degrees has a better Pay Structure than a Medical Library, Well almost!!. I find Dr. Mohamed Taher comments on Isolatr rather interesting when he argues with help of Ranganathan's Third law on his blog Information Visualization. InfoVis:Wiki project is intended to provide a community platform and forum integrating recent developments and news on all areas and aspects of Information Visualization. ExpressPDF :: Convert online Word, Excel, Web pages to PDF Free ! ExpressPDF is an online service that lets you convert Microsoft Office documents to PDF. This service can also convert Web pages to PDF ! I have submitted my following post to IAMI Discussion Forum to start the ball rolling on Medical Digital Library. Content is the key to a digital library like it is for the physical library. However, Intellectual Property Rights issues are more complex for Digital Libraries. This is due to the fact that even a single digital copy can serve the whole world. Therefore publishers are obviously a worried lot. Therefore they normally extend their protection of rights covered by Copy-Right Laws by means of contracts and licensing. While the publishers are trying to lobby for greater rights over Digital Content, the academics are in the picture now for a movement called “Open Access” < http://www.earlham.edu/~peters/fos/brief.htm >. Open-access (OA) literature is digital, online, free of charge, and free of most copyright and licensing restrictions. What make it possible are the Internet and the consent of the author or copyright-holder. Open Access is possible in academics because the authors’ motive for publishing article is never the financial gain but the appreciation of the peers. Open Access is of two types - Publishing and Self-archiving. Publishing is like the traditional journal publishing – only difference is that access is free to end-user [For example http://www.biomedcentral.com/ ]. Self-archiving is where the authors having rights over their documents upload them publicly accessible repositories [for example http://openmed.nic.in ]. Now about 90% plus [ http://romeo.eprints.org/stats.php ] of traditional journals [under the “Open Access” pressure] have allowed their authors to self-archive their articles in one form or the other. It has to be kept here in mind that Copyrights are originally with the authors without any formality or requirement to register with any agency. However, authors were unethically exploited by commercial publishers take asking to transfer rights in their favor before a manuscript can be published. As authors’ main objective has always been to maximum readership of their work, they happily surrendered their rights. But things are changing now fast. Many countries are in process to mandate that research results of publicly funded must be made public. Neuroscience Gateway, a resource for the latest research, news and events in neuroscience and genomics research has been developed collaboratively by the Allen Institute for Brain Science and Nature Publishing Group. Directory of open access journals: Now 60 Library and Information Science are listed in DOAJ. Dissect Medicine is a place to read and comment on the latest medical news and research. Dissect Medicine users can rank and submit stories, which are reviewed by other users. Talkr allows to listen text-only blogs. Atleast someone liked my thought - "Everybody has a librarian inside." How to build a quick solution to inculcate Knowledge Sharing in an organization, using the raw power and versatility, structured blogging (SB). 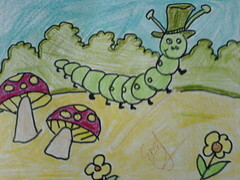 A drawing of Caterpillar by my daughter Deepakshi in her IV class. 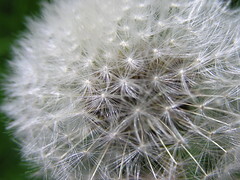 I took the photo with my SE 750i Camera Phone. I learned that these days Digital Cameras encode the metadata related to photograph in EXIF (Exchangeable Image File) data format. Isn't the importance of metadata growing like the Caterpillar? "Today, a large and growing number of students and scholars routinely bypass library catalogs in favor of other discovery tools, and the catalog represents a shrinking proportion of the universe of scholarly information. The catalog is in decline, its processes and structures are unsustainable, and change needs to be swift. At the same time, books and serials are not dead, and they are not yet digital. Notwithstanding widespread expansion of digitization projects, ubiquitous e-journals, and a market that seems poised to move to e-books, the role of catalog records in discovery and retrieval of the world’s library collections seems likely to continue for at least a couple of decades and probably longer". Folksonomy - < http://en.wikipedia.org/wiki/Folksonomy > may not as effective if looked from professional angle. However, its big plus point is that - it works!!!. Take for example of http://del.icio.us - it allows people to save bookmarks on their server. And to allow organization of these bookmarks people can classify them broadly and loosely by some words. This actually allows ordinary people to build their own personal libraries of Internet Resources. They Select and Classify resources. They can use these whenever they want. Story does not end here – it actually begins. They can also share their libraries with others by just referring a simple URL. The end product is collection of Internet Resources, which the users have themselves selected collectively and classified collectively. Of course the individual items in the collection get ranked automatically based on how many people have book marked (Tagged). OJAX provides a highly dynamic AJAX based user interface to a federated search service for OAI-PMH compatible repository metadata. OJAX is simple, non-threatening but powerful. It attempts to minimise upfront user investment and provide immediate dynamic feedback, thus encouraging experimentation and enabling enactive learning.